A full day seminar was organized by Glasgow Caledonian University to commemorate the 30th anniversary of the Coup in Chile. Several Chileans and several members of the British Solidarity campaign for Chile took part in this event in Glasgow and I was one of them. 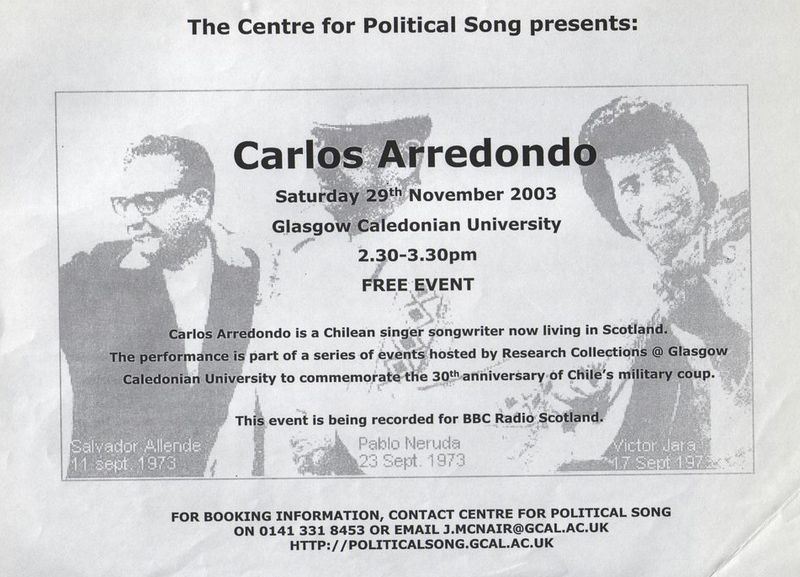 We all shared our experiences as active members of the Chilean Solidarity Movement in Scotland. We also had a discussion panel during the morning and then at night I gave a concert with the attendance of the BBC Radio Scotland. Among the participants to this seminar were: Phil O'Brien, Jan Fairley, Sandy Hobbs, Bob Somerville, Oscar Mendoza. 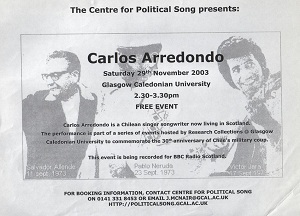 Phil, an academic,was the first President of The Glasgow Chile Solidarity Campaign. Sandy and Bob were two of Roll Royce trade unionists at East Kilbride, who in 1974 refused to carry out work repair work for engines belonging to the Chilean Air Force. They refused to work on the engines in protest against the Pinochet dictatorship. I remember well that Hugo Alvarez, Tulio Bravo and I went in 1974, as a group of Chilean refugees singers, to their factory to thanks them for their effort and validates with our presence, the situation in our country under the Pinochet dictatorship. Solidarity with the People of Chile in those days was very strong with many activities carrying out by us (the Chilean refugees community in Scotland) and the Chilean Solidarity Campaign in Scotland.